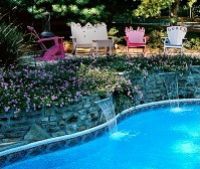 Metro Atlanta and West Georgia’s Premier Builder, Service and Pool Store | Brown's Pools & Spas Inc. 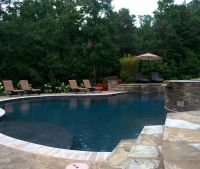 It may be cold outside, but now is the time to begin the design of your new pool and backyard living space. 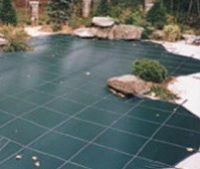 We build custom vinyl & gunite pools. Let Brown's Pools & Spas bring the vacation to you! 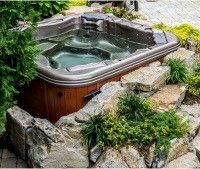 BullFrog Spas Are An Important Addition To Your Backyard Living Space. Renovations brings life back to your existing pool. Transforming your backyard dreams into a reality. A Perfect Solution for a Perfect Summer. Why pack your bags when you can vacation in your own backyard? Another feature to consider for your swimming pool is the custom decking that surrounds your backyard investment. The decking is the finishing touch to make your new swimming pool come to life. 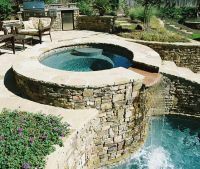 Water features and outdoor custom spas are also favorites from year to year as our clients construct their personal backyard vacation. 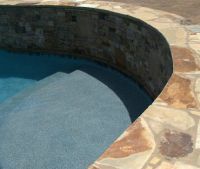 A Tanning Ledge or Shelf allows a person to lounge in the pool water while being exposed to the rays of sun for tanning. Regardless of the type of decking chosen, the coping (where the decking meets the pool wall) will be one of these three types: Standard aluminum coping, Cantilevered concrete coping, or Flagstone border coping. 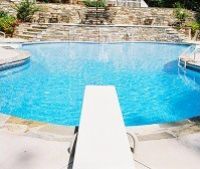 With the proper depth of a pool, we can install a diving board or rock as a special feature for your pool. Spas can be built with a swimming pool or completely standalone. 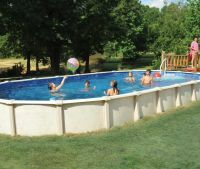 Some homeowners desire to have the spa spillover into the pool. Benches and tanning ledges make your pool the ultimate gathering place, allowing family and friends to gather for Tanning, Conversation and Relaxation. 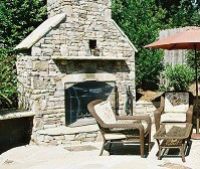 When creating your backyard resort environment, many homeowners create a beautiful focal point for their outdoor room by adding a fireplace or fire pit. When adding fire to your backyard living space, suddenly your space becomes perfect year round. 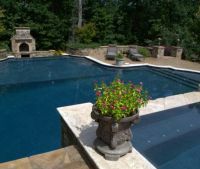 Since 1974, Brown's Pools & Spas have been the reputable partner that homeowners have trusted in the design and construction of their new pool and out door living spaces. 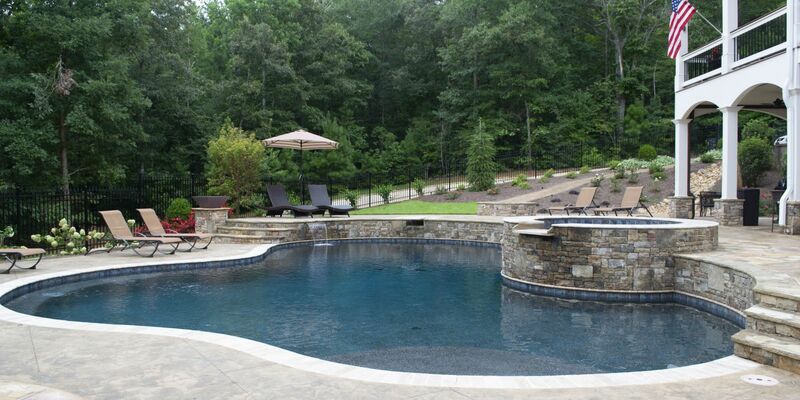 Brown's Pools & Spas build pools and outdoor living spaces in Metro Atlanta, North Georgia, and all of West Georgia. We are known across these communities as an established, family owned pool designer and builder since 1974. Need makeovers, resurfacing, new vinyl liners, new decks, new features? 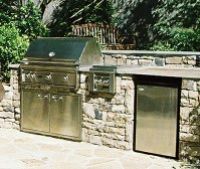 Our Remodeling Department can assist you with your backyard makeover. No job is to big or small for Brown's Pools & Spas Remodeling Department. Pool pump stopped working? Need your filter cleaned? Need a pool inspection at a new home? Maybe your looking for a new pool cleaning company or just need a one time cleaning? Brown's Pools & Spas Service Department can assist you with all repair and cleaning needs. Are you looking for a certain product or brand? In search of a Bioguard Chemical? Or do you need your liner replaced, we have KafKo-Latham Products? Maybe your pool pump is ready to replace, we are fully stocked with Hayward Pool Products. Our Brands & Products section will help you find just what you are looking for. I just wanted to say thanks again for your help with our pool. It turned out great and we are enjoying it! Thank you so much for the beautiful job you and your staff have done building our swimming pool. I just wanted to take a minute to thank you for the great job you did on our "Backyard Vacation."